Is The S&P 500 Ever Going To Enter Correction? For the second time in as many days, the U.S. equities indices have shown signs of weakness on the cash open. Earlier, the DJIA opened down 150 points and the S&P 500 followed suit. Since then, we have seen a moderate recovery, but both indices remain firmly in the red. The U.S. Federal Reserve is almost certain to tighten the money supply in December. Passage of the Trump tax plan by Congress is unlikely this year. When you add it all up, there is reason for concern facing the current bubble in U.S. equities. No matter which side of the fence you are on, be it bull or bear, today’s early action in the E-mini S&P 500 has brought a rare technical occurrence. 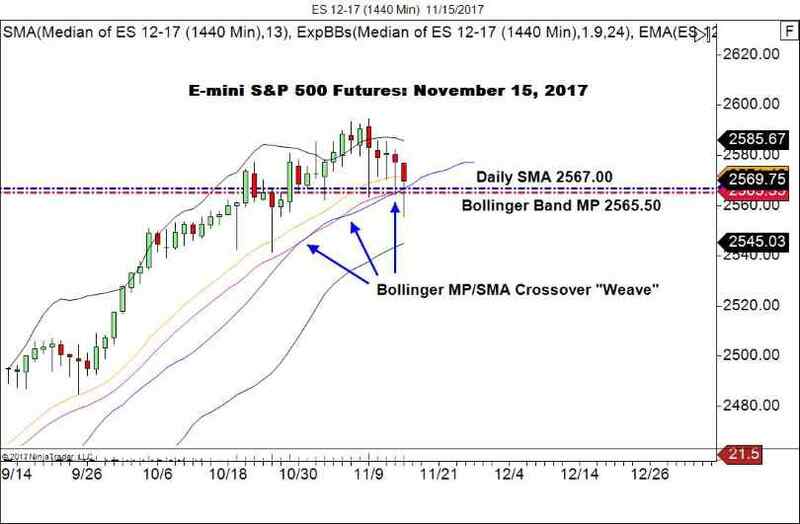 The Bollinger MP/Daily SMA crossover “weave” formation has been a valid indicator of shifting market sentiment. While still bullish, momentum has slowed. For the first time since September 4, price has extended under the Daily SMA and Bollinger Midpoint. If the E-mini S&P 500 futures close in the red, we will have posted negative trading days four out of the last five sessions. Traders that have attempted to call the top of this market have gotten drilled time and again over the course of 2017. At this point, who is eager to short U.S. equities? From every rational perspective, this market looks to be losing steam. With the end of year profit taking, FED action, and tax cut failure on the horizon, aren’t we poised for a correction? While I am certainly not a fan of shorting this market unsuccessfully yet again, there are reasons to at least consider doing so. For now, I will be watching today’s close carefully. If it is heavily in the red, it may be time to consider a position to the short.